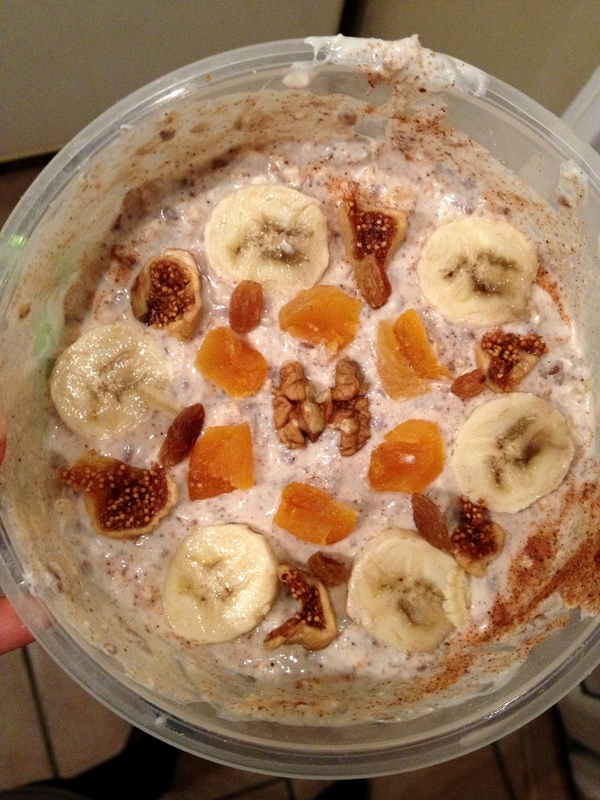 I honestly love overnight oats. It sure is one of my favorite ways to have my oatmeal. And probably the best thing about it is that you can stay in bed longer in the morning because you make it at night and it’s easy to take with you. And getting out of bed on an early morning with a long working day ahead is much easier when knowing there already is a nice breakfast waiting for you in the fridge. 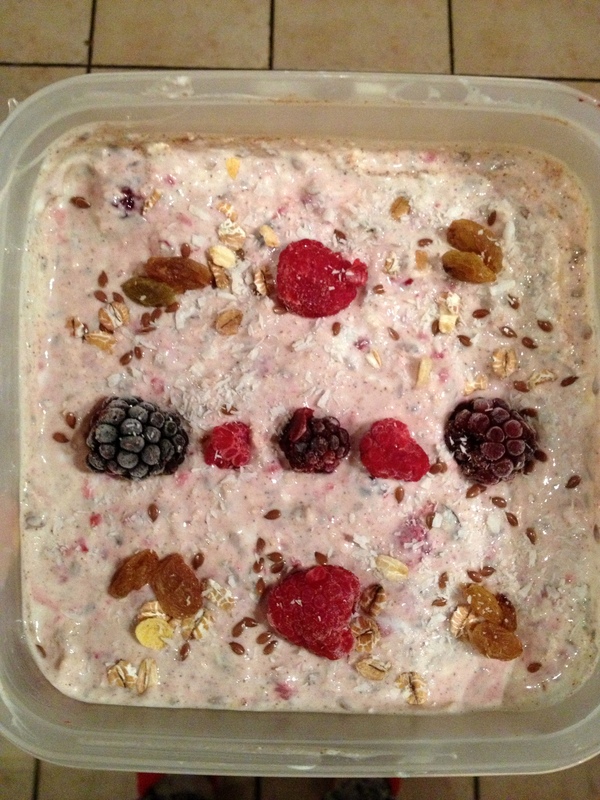 I got a lot of questions about how I make my overnight oats on instagram so I’ll just post my “recipe” here. It’s actually not a real recipe, I just throw everything I feel like in there and put in the fridge but I’ll write down how I mostly do it. 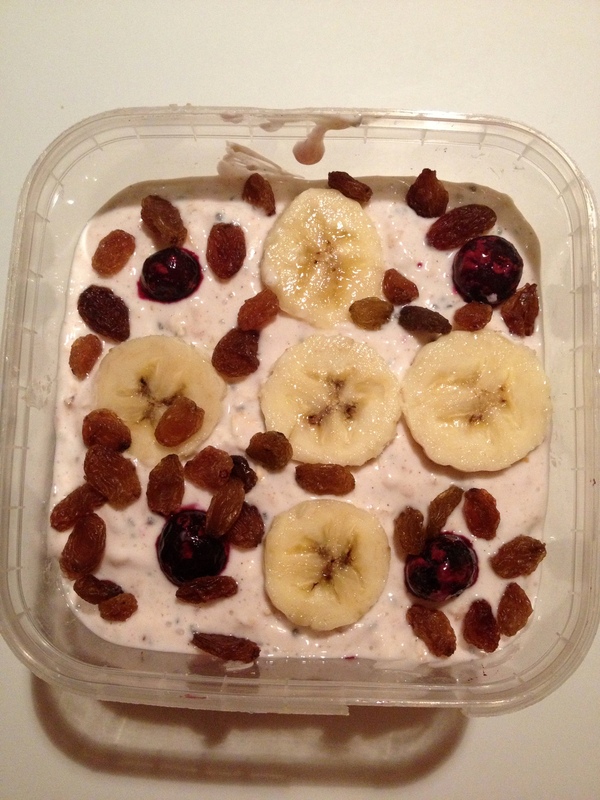 First I’ll explain what overnight oats actually is about. It just simply means that you mix your oatmeal with any kind of liquid at night, put it in the fridge and eat it in the morning. 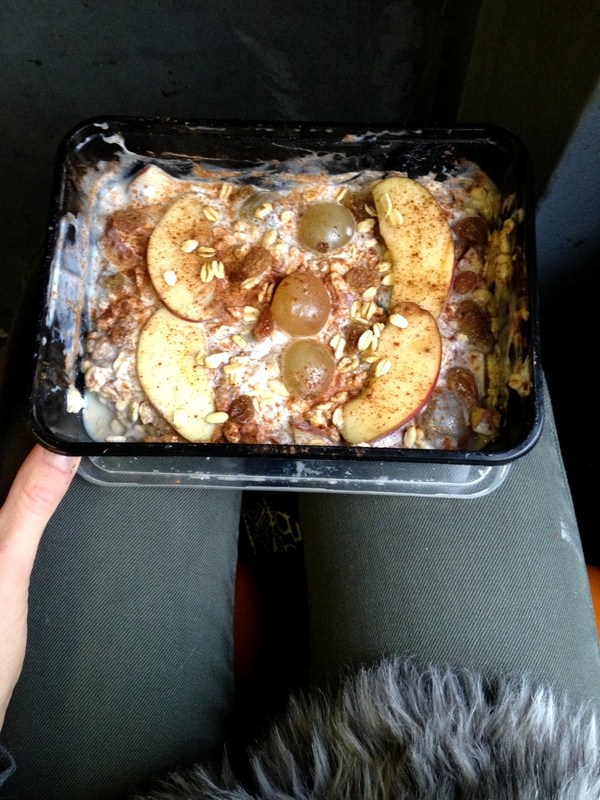 Because the oats are in the liquid for so long they absorb the liquid so you get a nice soft porridge-ish texture. And the spices you add at night also get absorb so you’ll taste them even more in the morning than right after you add them. 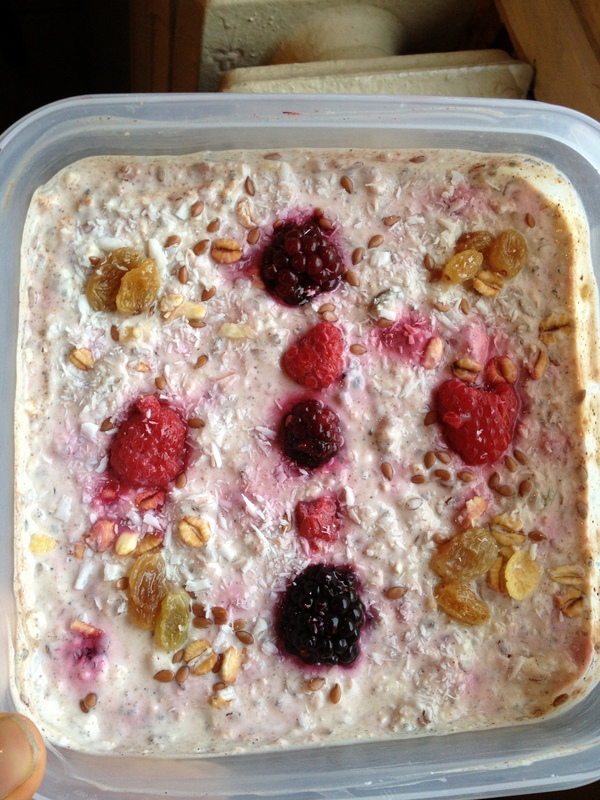 I never really measure while making it but I normally do about 1/3 yogurt, 1/3 milk and 1/3 oats. 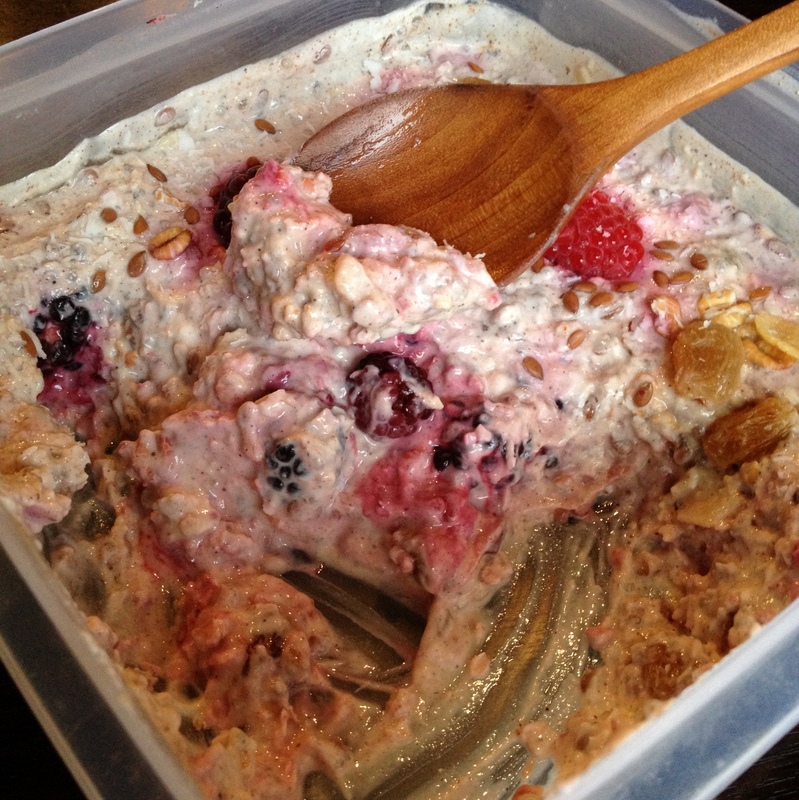 (It depends on how much you want to make but if you want to use for example 1 dl oats, use 1 dl yogurt and 1 dl milk) And than just add whatever you feel like, the variations really are endless. 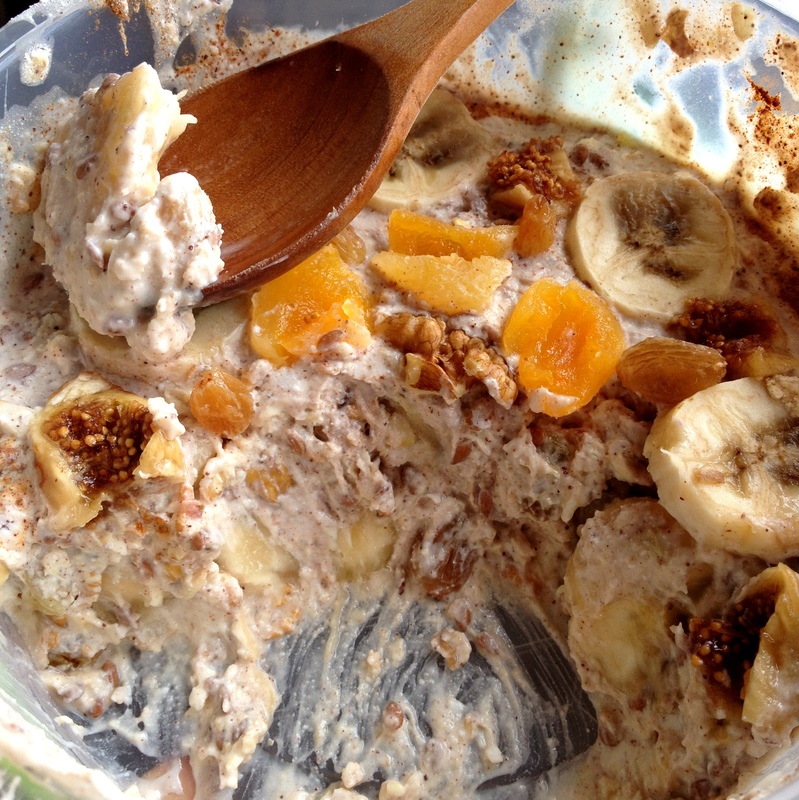 I love to add banana, it get nicely soft overnight and gives it all a really sweet taste. And I almost always add cinnamon, just because I love cinnamon. I’ll post some variations ideas I made down here. 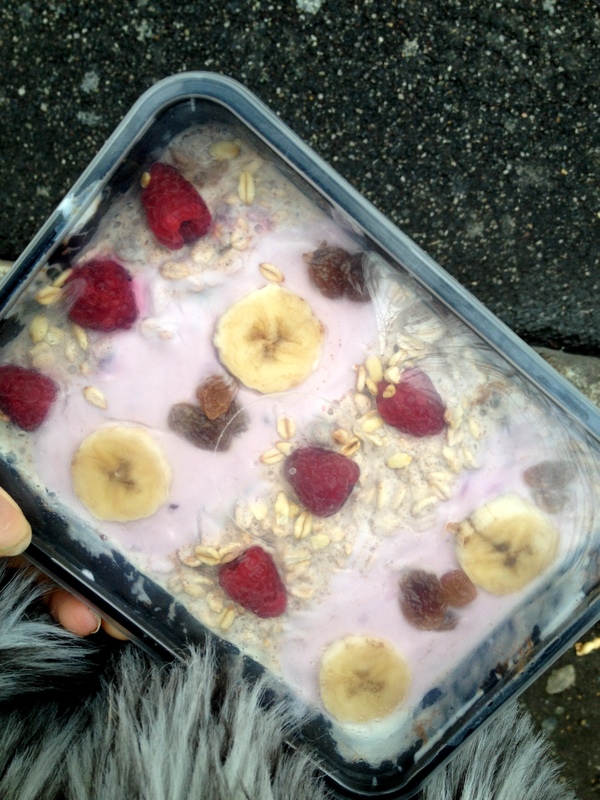 Overnight oats on the way to a job in Milan. 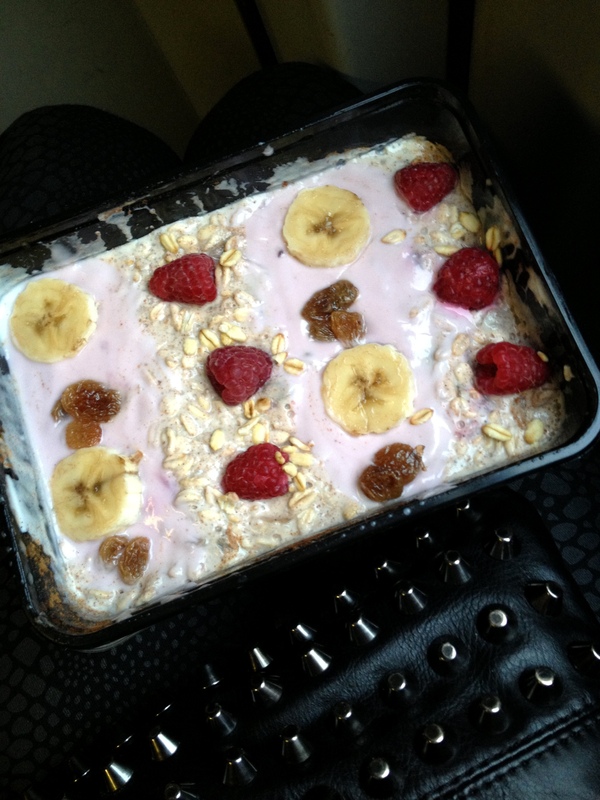 Besides my basic ingredients I added cinnamon, banana, raspberries and raisins and topped with a bit berry yogurt. In the making at night and on the way to work in Milan again. 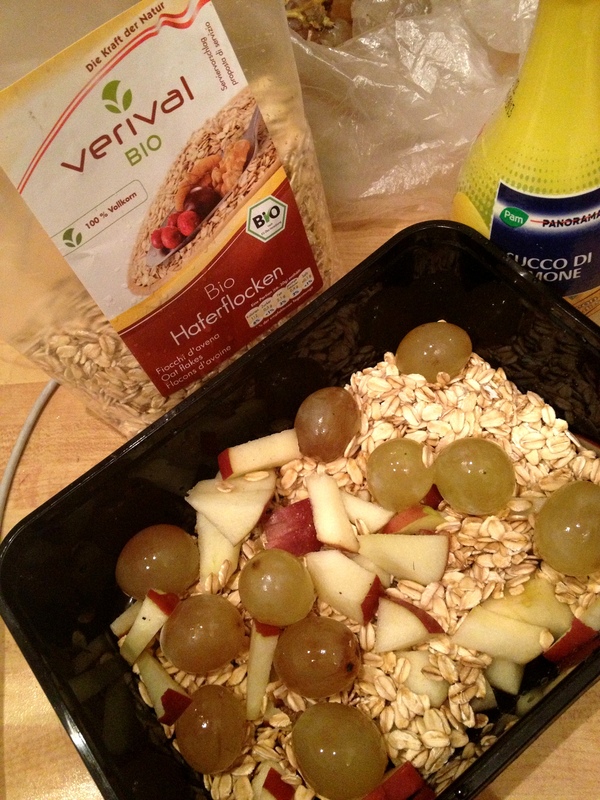 I added cinnamon, apple, grapes and raisins. 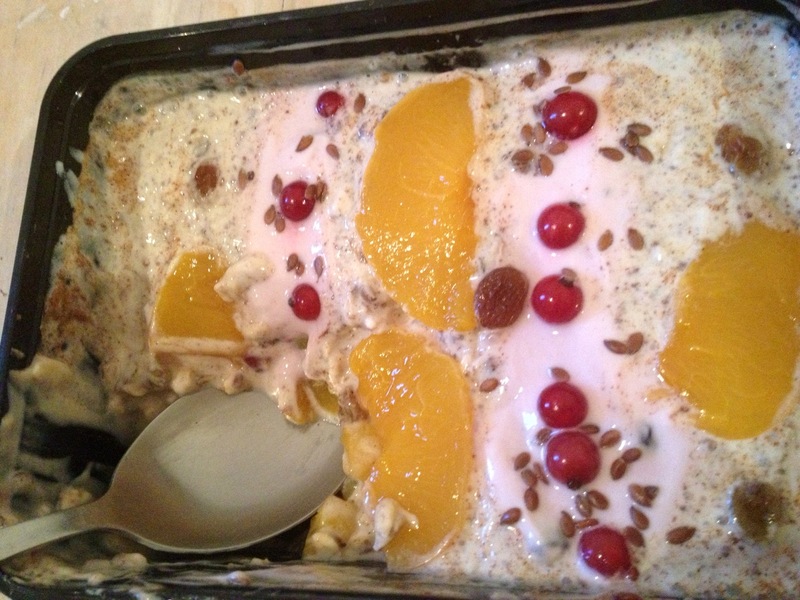 I added cinnamon, flaxseeds, red berries, raisins, and peach. 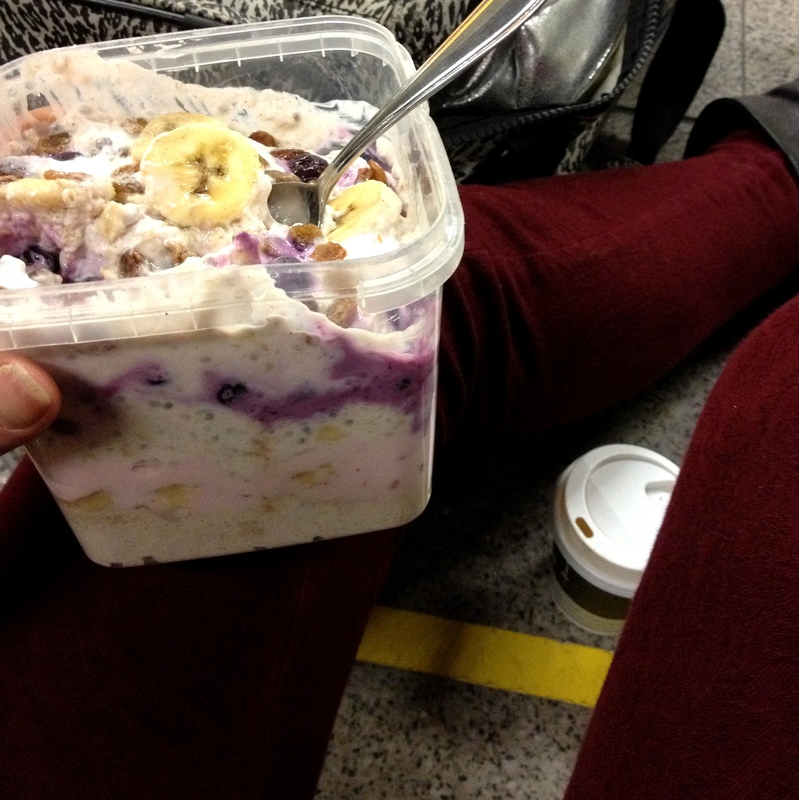 Overnight oats before the fridge at night and on the way at the airport. I’m enjoying it while waiting on my flight to Istanbul. 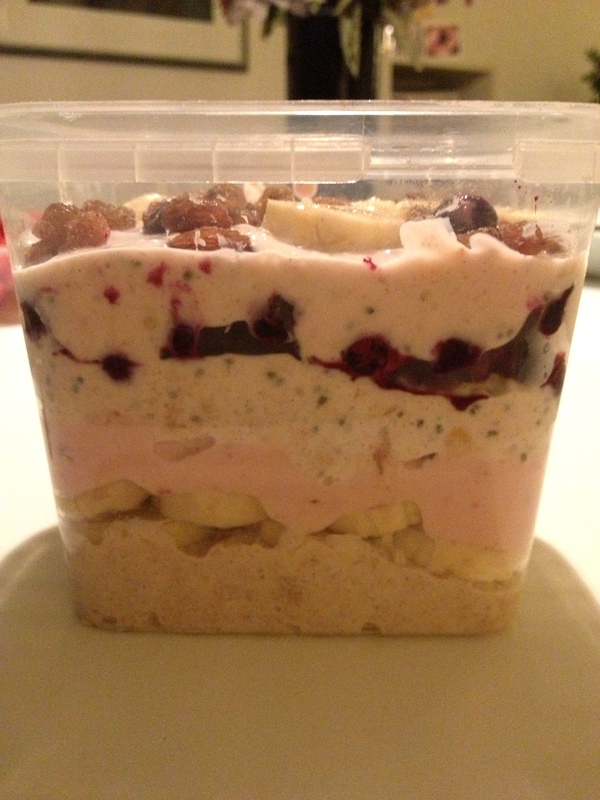 This one has a lot of layers, what’s in there: banana, cinnamon, grated coconut, chiaseeds, blackberries, raisins and I also made some layers of strawberry quark between the layers of overnight oats. Before an early call time in Istanbul. 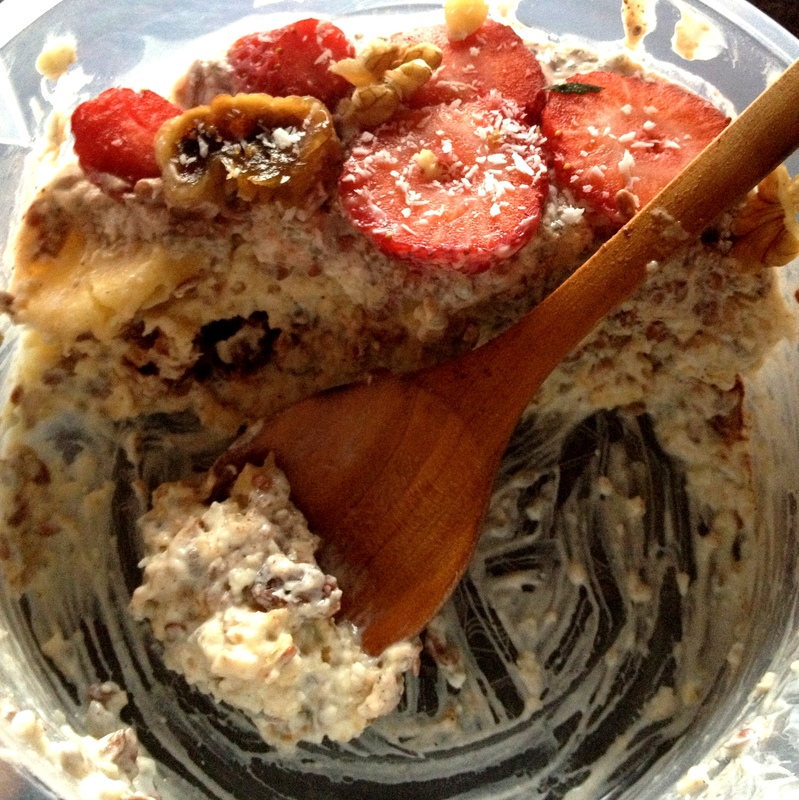 I added cinnamon (what a surprise), banana, strawberries, chiaseeds, flaxseeds, raisins, grated coconut and topped it with a dried fig and some walnuts (I would not recommend to mix nuts in the overnight oats because also the nuts get soft and what I like about nuts is that they are crunchy. But they are perfect to topped it with). 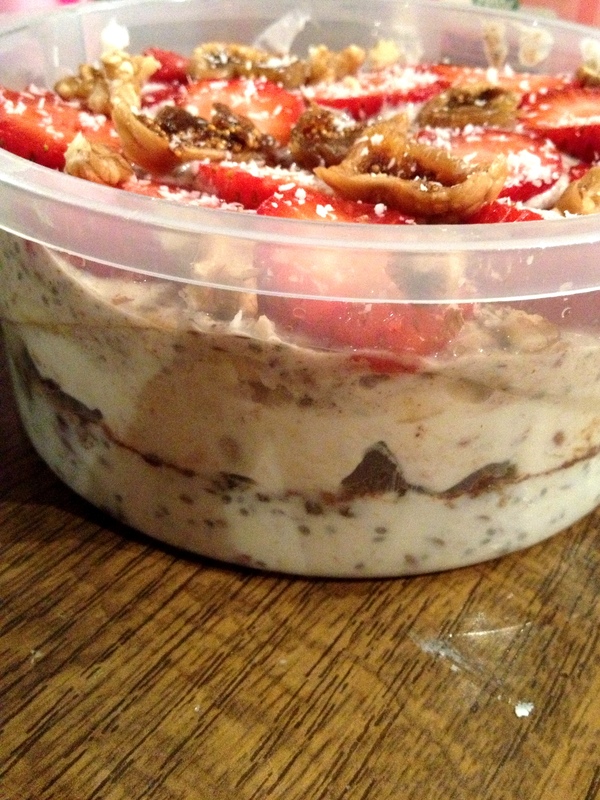 Overnight oats at night right before putting them in the fridge and in the morning right after getting them out (and one while enjoying it). 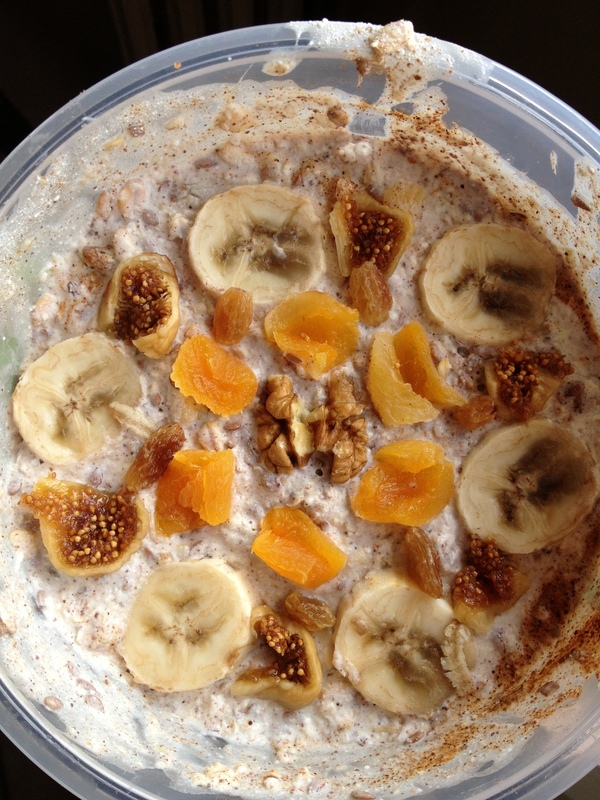 Guess what I added first, starts with a c.. (yes, that one again) and banana, raisins and some dried apricot. 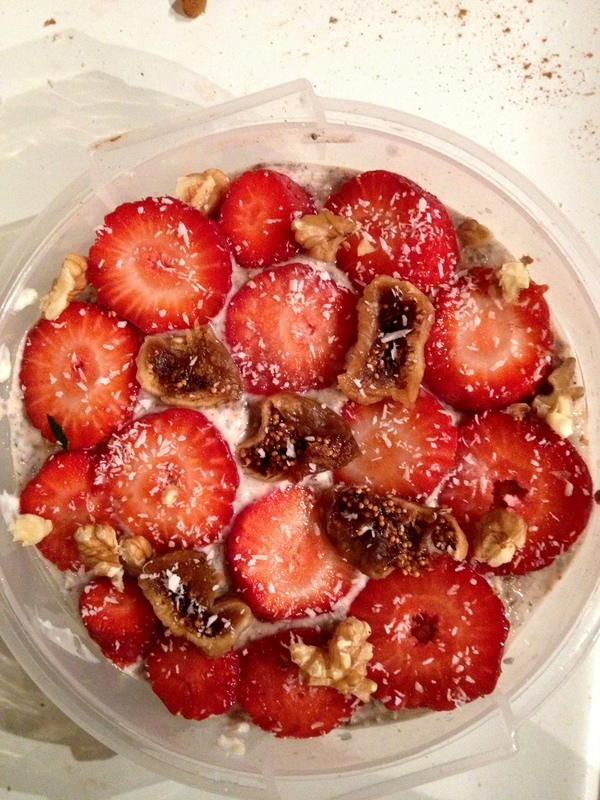 Topped it with a dried fig and a walnut again. The last ones I took before I went to sleep last night and this morning before another early job in Istanbul. In there is cinnamon, raisins, flaxseeds, chiaseeds, grated coconut and frozen raspberries and blackberries (I would let them unfreeze a bit before mixing it and putting it in the fridge). Thanks for this post. Looking forward to making some over night oats myself.